[ Sir Benjamin Ward Richardson, physician and medical author. ] 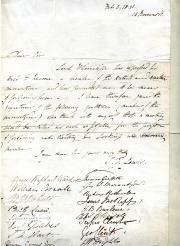 Typed Letter Signed ('B W Richardson') to Major R. H. C. Tufnell, concerning missing numbers of the Madras Journal. With newspaper cutting of his obituary. 1p., landscape 12mo. On aged and worn paper, with strip of discoloration affecting Richardson's signature. The text concerns 'the numbers of the Madras Journal [which] have not yet turned up'. Accompanied by an unattrtibuted newspaper cutting of Richardson's obituary, laid down on a leaf removed from a notebook. [ Sir Hamilton Seymour, diplomat. ] Calling Card, carrying an Autograph Note to 'Baron Ward' on seating arrangements. [ William Powell Frith, English painter. ] Printed 'Vanity Fair' 'Spy' cartoon by Leslie Ward, of W. P. Firth ('No. 236. Men of the Day, No. 63. | "The Derby Day. "'), with Autograph Note Signed by Firth ('W. P. Frith') to 'The Misses Savage'. 'Spy' cartoon from 'Vanity Fair' (London), 10 May 1873. 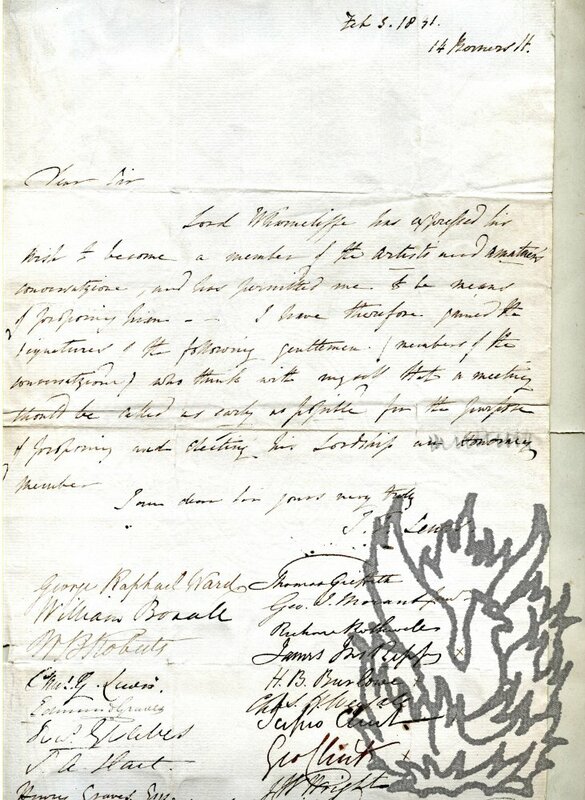 Autograph Note Signed on letterhead of 114 Clifton Hill, [ London ] NW. 12 May 1887. ONE: Printed 'Spy' cartoon. 35.5 x 23 cm. Coloured. In fair condition, lightly aged and worn. A placid Firth is shown before an easel, with brush in one hand and pallette in another. TWO: ANS. 2p., 12mo. With mourning border. 'Dear young ladies | I have pleasure in complying with your request for an autograph. | Faithfully yours | W. P. Firth. | To | The Misses Savage'. [ Mrs. Humphrey Ward, novelist. ] Autograph Letter Signed ('Mary A. Ward') [ to W. J. Fisher ], regarding 'the fund to be raised for Mr. Harold Frederic's widow & children', expressing disquiet over 'circumstances disclosed' at .Frederic's inquest. 25 Grosvenor Place, London SW, on cancelled letterhead of Stocks, Tring. 5 December 1898. An interesting letter regarding a celebrated Victorian scandal. In 1884 Frederic had come to England with his wife and five children as the London correspondent of the New York TImes. He set up a second household with Kate Lyon, with whom he had a further three children. Lyons was a Christian Scientist, and when Frederic suffered a stroke in 1898, she tried to cure him by faith healing, but he died. At the instigation of Mrs Frederic, Lyon was tried for manslaughter, but was acquitted. 3pp., 12mo. Bifolium with mourning border. [ William Clark Russell, nautical author. ] Offprint of article about him by 'Capt. W. J. Ward (Cardiff)', titled 'A National Asset'. With photographic portrait of Russell, and reproduction of sonnet to him by Julia D. Young. 'Reprinted from "The Maritime Review."' No place or date (but during the reign of King George V). 2pp., 4to. Printed on the same side of one piece of shiny art paper, folded to make a bifolium. Aged and stained, with wear and slight loss to extremities. Photograph of Russell beneath title, alongside 'Sonnet | To W. Clark Russell', reprinted 'From "English Sea Pictures." By Julia D. Young, Author of "Barham Beach, the President's Poem." - New York.' The author laments that '[i]n this country, it is not the fashion to ennoble those who really do something for their time and generation', such as Russell, whose 'stupendous output' consists of 'fifty-seven books everyone [sic] of them good'. [ Printed advertising pamphlet. ] The Authors' Agency for the Criticism, Revision, and Disposal of Manuscript, And all Work Involved Between Author and Publisher. The Authors' Agency. William A. Dresser, Manager. P.O. Box 1193, Boston, Mass. Undated. 3pp., 12mo. Bifolium. In fair condition, lightly-aged. Beneath the drop-head title: 'The Agency is authorized to refer to the following well-known writers: | Noah Brooks. | Hezekiah Butterworth. | Mrs. Margaret Deland. | William Elliot Griffis, D.D. | B. O. Flower, [Ed. Arena.] | Mrs. Burton Harrision. | Mrs. Julia Ward Howe. | William Dean Howells. | Mrs. Louise Chandler Moulton. | Philip S. Moxom, D.D. | Thomas Nelson Page. | A. D. F. Randolph, Publisher. | Charles Dudley Warner. | Mary E. Wilkins. | William Hayes Ward, D.D., [Ed. Independent.] | J. A. Wheelock, [Ed. On letterhead of Stocks, Tring. 12 March 1895. 3pp., 12mo. Bifolium with mourning border. In fair condition, on aged and worn paper. She apologises for the delay in writing, explaining: 'my hand has been dreadfully lame, & I have no secretary'. She explains that she has spoken to 'Mr. Craufurd' regarding the cottage, but that there is 'an old lady here, the widow of a farmer, a certain Mrs. Mead, who is supposed by Mr. Craufurd to have a prior claim'. She discusses whether Mrs Mead truly wants the cottage, and the possibility of making alterations to it, ending with remembrances to the recipient's father and mother. [ Ward, Lock & Co., Ltd., London publishers. ] Booksellers catalogue: 'A Little List of Children's Books that are Certain to Please | Christmas 1917'. Ward, Lock & Co., Ltd., Warwick House, Salisbury Square, London, E.C. Christmas 1917. 24pp., 12mo. Yapp-bound in brown-paper printed wraps. Stapled. Very good. Printed in brown ink on glossy paper, with one book per page, each with an illustration of the cover. Begins with 'The Wonder Book | (Fourteenth Year of Issue.)' and ends with 'Animals All | By Ellen Velvin'. Includes four works illustrated by Margaret W. Tarrant, including 'Alices Adventures in Wonderland'. Scarce: no copies traced, either on COPAC or on OCLC WorldCat. 'ENT[ERED AT] STA[TIONERS] HALL MARCUS WARD & CO.' Undated. On 6.75 x 10.25 cm card. In good condition, lightly aged and worn. Crane's illustration is printed in gold, blue, red, pink and brown, with the caption at foot, encased in a characteristic decorative border reading 'MAY NEW YEAR BRING FROM LOVERS TRUE | LOTS OF VALENTINES FOR YOU!' A winged Cupid in doorway to the right, dressed in blue cap and suit with knickerbockers and red stockings, delivers letters to three girls and a baby in a bath chair. Outside the border, at foot: 'ENT STA HALL MARCUS WARD & CO.' Printed in lilac on reverse is the poem by 'W. J. [Lauren R. Stevens.] Autograph Letter Signed and Typed Letter Signed (both 'Lauren') to English literary critic A. Alvarez ('Al'), discussing his decision to leave Harvard and his first novel, 'The Double Axe', an inscribed copy of which is included. TLS: 430 W. Allen's Lane, Philadelphia 19, Pennsylvania. 5 October 1960. ALS: on his (cancelled) letterhead 1717 Cambridge Street, Cambridge 38, Massachusetts. 31 January 1961. Book: New York: Charles Scribner's Sons, 1961. TLS: 2pp., 12mo. In good condition. The letter begins: 'Dear Al: | Last Thursday morning, while sitting in a barbar chair, I asked myself a question which a number of people have been asking me recently, namely, What are you doing at Harvard? I couldn't come up with a very satisfactory answer, so I went to a friend's house on Cape Cod for the weekend. Monday I saw the head of the English Department at Harvard, H. C. Baker. He said, "Follow your star," which seemed to me a little romantic, but all the same good advice. [Printed report in 'The Social Survey'.] Children Out of School. An inquiry into the leisure interests and activities of children out of school hours carried out for the Central Advisory Council for Education (England) in November-December 1947. N.S.110. Central Office of Information [London]. ('Crown Copyright Reserved'.) June 1948. 76pp., foolscap 8vo. Includes one fold-out leaf. Internally in good condition, on aged paper. In worn and chipped orange card wraps. With shelfmarks, stamp and label of the Board of Education Reference Library, London. Divided into the main headings: The Problem of Children's Play; How Much Spare Time? ; Clubs and Organisations; Games and Sports; The Cinema and the Radio; Reading and Other Hobbies; What Do Children Like Doing Best? A smaller (and earlier?) version of a 90-page item published with the same title and date, but with the author's name given as 'Joyce Ward'. New Series110. Central Office of Information [London]. ('Crown Copyright Reserved'.) June 1948. 90pp., foolscap 8vo. Includes extra leaf stapled in to make a fold-out. Internally in good condition, on aged paper. Author's 'Introduction' printed on inside front cover. In worn and chipped orange card wraps with damaged spine. With shelfmarks, stamp and label of the Board of Education Reference Library, London. Divided into the main headings: The Problem of Children's Play; How Much Spare Time? ; Clubs and Organisations; Games and Sports; The Cinema and the Radio; Reading and Other Hobbies; What Do Children Like Doing Best? [George Marshall Ward, artist and engraver.] Autograph Letter Signed ('G R Ward') to H. Magford, offering to lend two works by his father James Ward to the Crystal Palace, and the exhibition of another one among Manchester 'merchant Princes'. 31 Fitzroy Square W. [London] 27 April 1857. 2pp., 12mo. Bifolium. In very good condition, neatly placed by the second leaf in a windowpane mount. He has 'received an intimation' that his picture is in Bond Street ('from whence I must fetch it'), and is writing to say that he has 'two Pictures by my Father (one very small but a beautiful little bit) the other the Peak in Derbyshire; a Landscape by Smith of Chichester & a copy of mine after Liverseege all of which I would lend to the Crystal Palace if you would like to have them'. He can deliver these to Bond St on collecting the other. Issue of 'The Commercial Travelers' Home Magazine' including original illustrated articles on 'The King of Museum Builders' Prof. Henry Augustus Ward, the German-American trick-cyclist N. E. Kaufmann, and the 'Leviathans of the Deep' [steam ships]. The Commercial Travelers' Home Association of America, Binghamton, New York. Vol. VI, No. II. February 1896. 8vo, paginated 147-261, with frontispiece, and preceded by 16 and followed by 11 pages of advertisements. In original pink wraps, printed in black and red. In fair condition, on lightly-aged paper, in worn and chipped wraps. The article on the naturalist Professor Henry Augustus Ward (1834-1906), by William T. Hornaday, is titled 'The King of Museum-Builders' (pp.147-159, with frontispiece); that on Nicholas Edward ('Nick') Kaufmann (1861-1943) is by Harry Kenmore, and titled 'The Champion Trick-Rider' (pp.185-193); and that on 'The Leviathans of the Deep' (202-210) is by Alan Merriman. Autograph Letter Signed ('Saml. Smith') from the Whig poltician and barrister Hon. Samuel Stevens, asking the Adjutant General of the State of New York, L. Ward Smith, to be one of the 'groom's men' at his wedding. New York. 15 June 1842. Stevens married Mary Frances Smith (d.1890; second husband John Fowler Butterworth), daughter of Silas O. Smith of Rochester, and two of their children were the novelist Augusta de Grasse Stevens (1852-1894), and Marie de Grasse, Lady Evans (d.1920), wife of the English Liberal politician Sir Francis Henry Evans (1840-1907). 2pp., 4to. 35 lines of text. In good condition on lightly-aged paper. Addressed on reverse of second leaf, with postmark, to 'Mr L Ward Smith | Rochester | N.Y-'. The letter begins: 'My dear Ward | How affectionate & familiar a man is, when he is about to ask a favor. [Printed magazine, purportedly written by Mandy Rice-Davies.] After Denning . . . The Mandy Report. At Last - Mandy Rice-Davies tells All! 40pp., 4to. Not paginated. In very good condition. Covers and centre-spread printed in colour on glossy art paper, otherwise in black and white. Profusely illustrated. The third page carries an introdcution by 'Mandy', reading: 'Two questions . . . . . remain unanswered despite the many thousands of words written about the Ward Trial. How do girls like myself move into High Society circles? And just how loose are the morals of certain Top People? | These are the questions I have set out to answer - not in any way to whitewash myself. Autograph Album of Agnes Rothsay, daughter of Frank Rothsay, Actor-Manager of the Borough Theatre, Stratford, containing signatures, messages and drawings mostly by individuals connected to the stage, many in the company of 'The Prince of Pilser. Compiled while the Rothsays lived in West Ham, between 1906 and 1909. Landscape 8vo album with 82pp. on 73 leaves of different coloured paper in original cloth. Aged and loose, in worn binding. The autographs are mainly theatrical, and although lacking any first-rate actors, provide a tantalising glimpse into a lost world. Laid down are signed postcards from.Stella Gastelle, Ethel Ward and Ben Albert ('To Miss Rothsay | Best Wishes from her Dad's Pal Ben'). Autograph Note Signed ('Geo W McCrary') to Evarts. 16 December 1878. On letterhead of the War Department, Washington. 12mo, 1 p. Good, on ruled paper. A note of introduction for the bearer, Miss Ward [Genevieve Ward, actress]..
On one side of a piece of paper 28 x 22 cm. Text clear and complete. Aged and creased, with two small areas of slight loss (not affecting text) and closed tears. Part of previous mount adhering to the reverse. Twenty-four lines beneath the title, with the whole enclosed within a border. Begins: 'It is proposed to establish, in the midst of the dense population of Bedminster and Redcliff, a nursery for children under three years of age.' Ends 'Rev. A. H.
Signed application by John Frederick Lewis, proposing Lord Wharncliffe as a member of 'the artists' and amateurs' conversatzione'. With the signatures of seventeen artists and prominent figures in the art world of Georgian London. On one side of a piece of wove paper, 32 x 20 cm. Laid down on a leaf from an autograph album. In fair condition, aged and dusty with slight wear to extremities. The item is of added interest, dating as it does from the year of the Society's inception. The nine-line application is in the hand of the artist John Frederick Lewis (1804-1876), and is addressed to 'Dear Sir' - presumably the final signatory 'Henry Graves. Esq. [1806-1892, printseller] Sec. to the Artists and Amateurs Conversatzion. [sic]'.